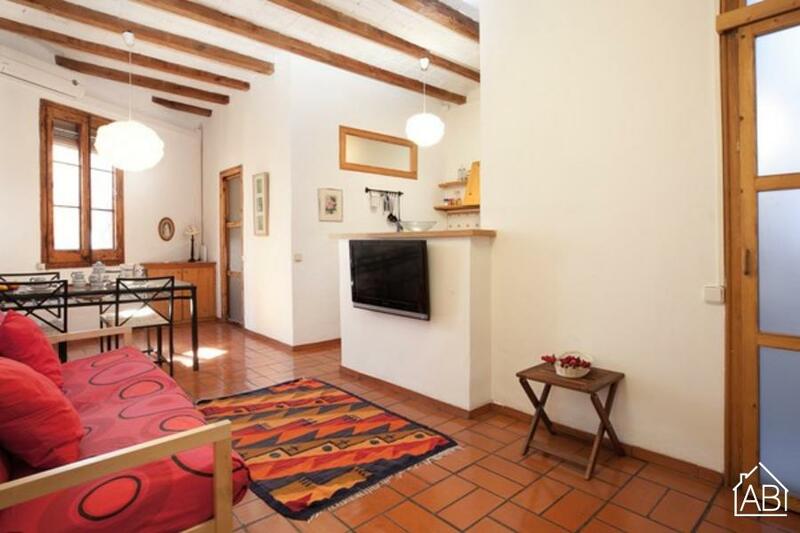 This charming two-bedroom apartment located in the upscale neighborhood of Gràcia. Guests will be able to experience true Catalan culture from this charming neighborhood. Local restaurants, bars and cafés line the streets, while many upscale boutiques can also be found in the area. This space, able to facilitate up to five people, is a great choice for couples or families. A simplistic, traditional design welcomes guests upon arrival. The exposed ceiling beams, alongside tiling throughout the apartment, gives it a subtle yet ever present traditional touch, reminiscent of Old Spain. The living room is furnished with a comfortable sofa, and a TV, perfect for relaxing after a day of sightseeing. An Internet connection is also available making it easy to stay in touch with friends and family back home. The kitchen is fully equipped allowing you to prepare your very own home-cooked meals. The main bedroom has a double bed, while two single bunk- beds can be found in the second room. The apartment has one bathroom. For a comfortable stay any time of the year, this apartment, complete with heaters and air-conditioning, is a great choice for a memorable vacation in the Catalan capital! Please note: The working hours of the owners of this apartment will be until 18:00h on December 24 and 31. Please arrange to check-in before 18:00h on these days. br/>Check-ins after 20h have an extra charge of 30€ and check-ins after 23h have a charge of 50€.